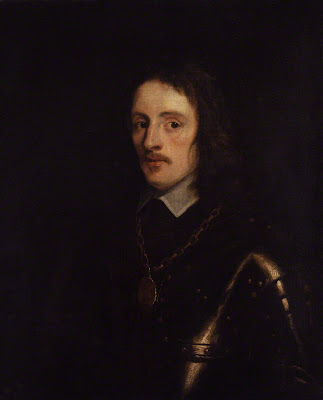 Is this a portrait of Sir Thomas Tyldesley 1612-1651? There are four known images of Sir Thomas Tyldesley in existence. The first, a painting formerly held at Hulton Park for many years and included in a previous post, has good provenance and the identity of the sitter has never been questioned. This has given rise to two copies: a pencil sketch by William Derby dated 1 August 1835, and an engraving by John Cochran for Edward Baine's History of the County Palatine of Lancaster in 1836. There is also an early 19th century stipple engraving by Robert Cooper in one of the illustrated editions of Clarendon's History of the Rebellion. This was appatently based on the Hulton Portrait and is undoubtedly intended to be Sir Thomas Tyldesley—though the resemblance seems limited! Portrait of Sir Thomas Tyldesley. A second painting, recently bequeathed to the gallery by the late Mr. S. M. Milne as a portrait of General Lambert, by Robert Walker, once formed part of Lord Hardwicke's collection at Wimpole, whence it passed to its late owner at the sale in 1888. This picture, somewhat in the nature of a fortunate sketch, represents a man in the prime of life, bust size, three-quarters to the left, wearing armour and a rare medal suspended from a chain round his neck. 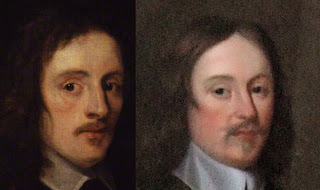 A comparison, however, of this bequest with the portrait of Lambert already in the gallery showed that the two pictures could not represent the same person. The authenticity of the portrait of Lambert in the gallery is unquestionable; it belongs to a type which agrees with the early engraving by F. Place and the larger and perhaps archetypal painting in the possession of Sir Mathew Amcotts Wilson, of which several variants exist. By means of a drawing in the Reference Library of the Department, made in 1835 by W. Derby from a painting in the possession of Sir William Hulton, Bart., of Hulton Park(1), I have succeeded in identifying this so-called portrait of Lambert as Sir Thomas Tyldesley (1596-1651)(FN1), the royalist general. Tyldesley fought with distinction at Edgehill, 1642, in command of troops raised by himself, and after the king's death continued to struggle for the royal cause, but was defeated and killed at Wigan Lane, where a monument was afterwards erected to his memory on the spot where he fell. An important feature in the identification of this portrait is the medal which Tyldesley is wearing. Although hastily sketched, sufficient of the subject is revealed, shewing an equestrian figure with both fore-feet of the horse raised. Three medals struck during the Civil War correspond with it in design, and of these only two need be considered. They are known as the Edgehill medal(1), commemorating the battle fought on October 23rd,1642, and were adopted by both Royalists and Parliamentarians. Rawlin, the engraver of both medals, utilized the figure of Prince Charles on horseback on the reverse of the Royalist version as the obverse of the Parliamentary, but omitted the letters C. P. from the latter. Though similar in this respect, the other side and their borders differ. Mr. Grueber, Keeper of the Department of Coins and Medals, British Museum, kindly examined the medal in the painting, and expressed his concurrence with the opinion that it is the Royalist and not the Parliamentary version of the Edgehill medal. There does not appear to be any record that Lambert was present at Edgehill, although a Parliamentary regiment which fought there was afterwards known by his name. It is, therefore, not surprising to find Tyldesley wearing a memento of an engagement of which he had good reason to feel proud, but it is curious that in the great National Portrait Exhibition of 1866-8 General Lambert should have been represented only by a picture which proves to be that of a distinguished cavalier. (1) The portrait was engraved by J. Cochran for Baines's History of Lancashire, 1836, Vol. III. (2) Reproductions of these medals will be found in Medallic Illustrations (British Museum), Plate XXVI, and in Mayo's Medals and Decorations of the British Army, 1897, Vol. I, Plates V and VIII. ROYALIST. The son of a wealthy Lancashire family Thomas Tyldesley was trained as a professional soldier and served his apprenticeship in Germany. On the outbreak of the Civil War he raised a large body of troops at his own expense, and placed himself under the orders of the Earl of Derby. He fought for the king with distinction at Edgehill, and led the successful assault on Burton on Trent, for which service he was knighted and made a Brigadier. He assisted in the capture of Bolton and later became Governor of Lichfield, which, however, he was forced to surrender in 1646. In the second Civil War, after Cromwell's victory at Preston, he was captured at Appleby and forced to go abroad. Landing in Lancashire in 1651, he called upon his friends to rise in the interests of Charles II. Before he could equip and organise the forces which joined him, he was attacked by Roundhead troops under Col Lilburne, and killed in the action which followed. Half-length, in black armour, turned slightly to left; very dark brown hair falling to the shoulders, moustache and lip-tuft rather pale in colour, large brown eyes looking at the spectator; a plain white turn-down collar; a gold medal which bears in relief an indistinct equestrian figure (probably a memorial of the Battle of Edgehill)(1); background very dark brown; lit from the right. (From the Hardwicke collection, Wimpole; exhibited NPE 1866, no. 800; Hardwicke sale, Christie's, 30 June 1888, Lot 57, bought by S M Milne; bequeathed by S M Milne and accepted by the Trustees, June 1910. This portrait was known from at least 1798 as General Lambert (qv), though his features are very different (2). The identification as Tyldesley was put forth by J D Milner in 1911, and rests largely on comparison with a portrait of Tyldesley in the collection of Sir W R Hulton Bart. (1910) (3). Our painting is very close to Dobson's work, but is not by him; the costume suggests a date c1645 to 50. Though the identification seems reasonable it cannot be held as strictly proven. Waagen, Supplement, p 522; J D Milner, ' Portrait of Sir T.Tyldesley', Burlington Mag. vol XIX (1911), p 163; Baker, vol. I, p 99 (as a copy after Dobson or work by a pupil of Dobson's) . (1) Medallic Illustrations Plates (1904) pl xxvi, nos 5,6. (2) Lambert's name was written in a hand perhaps of the late eighteenth century on a label formerly on the back of the picture. (3) Engraved by J Cochrain for Baine's Lancashire (1836), vol III. What do you think—is this the same man? 1. Both Milner and Piper give Sir Thomas Tyldesley's year of birth as 1596—this mistake no doubt resulting from the erroneous entry in the Dictionary of National Biography. In 2008 Catharine MacLeod, 17th Century Curator at the National Portrait Gallery, very kindly arranged to amend its records to show the correct date of birth of 1612.